ROCKINGHAM, N.C. — Dr. Legrand Thurman Scott Jr. of Rockingham, passed away at Charlotte Medical Center on June 24, 2015. He was 78 years old. Dr. Scott was born on January 23, 1937 in Florence, S.C., to Janie Jones Scott and Legrand Thurman Scott Sr. He graduated from Wofford College and continued his education at the Medical University of South Carolina in Charleston graduating in 1963. After a residence at Spartanburg Regional Hospital, he served a tour with the U.S. Army in Vietnam. In 1967 he and his family settled in Rockingham, joining Dr. Stanley Vetter at Richmond Medical Center. Dr. Scott is survived by his wife, Ashby Moncure Dunn Scott, whom he married in 1960. 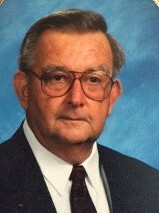 He is also survived by two daughters, Mardi Smith of Columbia, S.C. and Jane Scruggs and her husband, Jeff Scruggs, of Pinehurst; five grandchildren, Mariah Smith Buyers and her husband Johnathan Buyers, Chelsea Smith, Charles Scruggs, Legrand Scruggs, Ashby Scruggs, as well as one great-granddaughter, Kinsley Beverly. He is also survived by a sister, Gerri Moore, and a brother-in-law, Ralph Moore, both of Columbia, and two nieces, Beth Fisher and Debbie Carlin. Services will be held at 11 a.m. on Saturday, June 27 in the mausoleum at Richmond Memorial Park. In lieu of flowers, memorial donations may be made to First United Methodist Church, PO Box 637, Rockingham, NC 28380 or Sanger Heart and Vascular Fund c/o Carolinas Heathcare Foundation, 1221 East Morehead St, Charlotte, NC 28204. Watson – King Funeral Home in Rockingham is assisting the Scott family. Online condolences may be sent to www.watsonkingfuneralhome.com.